Ambidexterity is not a really intuitive concept (definitely not for a non-native English speaker), ambiwhat? Originally, it refers to “an individual’s capacity to be equally skillful with both hands” but as an academic construction (in management) it refers to an organisation’s capacity to do two things equally well. Not just any two things, but dualities like exploration vs exploitation, efficiency vs flexibility, differentiation vs cost leadership, etc. 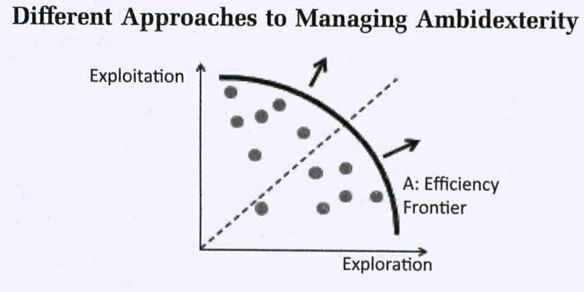 Ambidexterity is achieved through managerial capability, but we need to keep in mind that it is very hard to achieve. And although we can organisationally separate the competing objectives (a common approach) it does not really “solve” the challenge because ultimately in the end the duality, for example exploration vs exploitation, needs to be resolved by someone. As such, it cascades through the organisation and everybody faces the issue. For example: Should I develop new skills for the benefit of the organisation or should I focus on the best use of my existing skills? Fons Trompenaars and Charles Hampden-Turner’s research on culture highlights the concept of dilemmas (e.g. Individualism vs. collectivism). Their solution is to “crack the axis” of the continuum, which is – I believe – is similar to the conceptualisation of ambidexterity. Birkinshaw and Gupta, however, emphasise that it is crucial to measure the ends of the continuum of – for example – exploration and exploitation separately (so NOT as poles of a continuum) because otherwise you automatically end of on the diagonal (dotted) line. Still a bit abstract? But definitely food for thought…. Next Next post: Multidisciplinary Research – A Challenge and An Opportunity?